August 13, 2018.- The Ledwidge Lookoff Rally, fifth of eight rounds in the 2018 Eastern Canadian Rally Championship (ECRC), presented by Halifax’s Steele Subaru and held in Dartmouth, Nova Scotia, saw Jonathan Conrad and co-driver Tim Dine take home the victory in their Subaru WRX STI. This was the first win for Conrad, after a nice battle with Max Méconse and Daphne Sleigh, who led for the first half of the event. Also in a Subaru WRX STI and entered in the Production 4 wheel drive class, Méconse/Sleigh finished only 39 seconds behind their rivals. Dust was a factor on the competitive stages in the second half of the rally, causing visibility issues for all but the first car on the road. 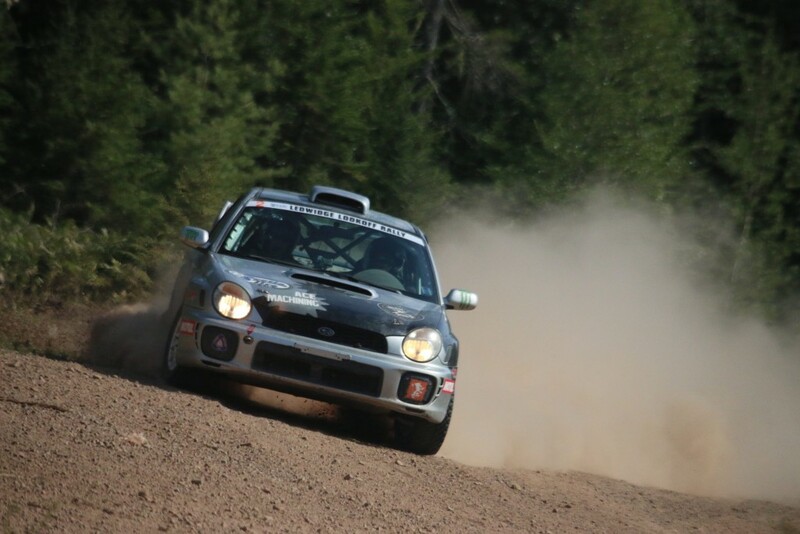 The podium was completed by Stan Hartling, of Turks and Caicos, co-driven by Andy Proudfoot, of Newfoundland, also in a Production 4WD Subaru, as well as Nova Scotians Cal Vandaalen/Meg Grandmaison, who challenged for third place throughout the rally. Ian Pearce/Gordon Sleigh (Subaru Production 4WD Class) rounded out the Top 5. In two wheel drive class, victory went to Michael Romaniuk and Martin Maunder in a Volkswagen Golf GTI, who were competing at their very first rally and finished in sixth overall, ahead of the only team entered in Open 4 wheel drive, Sam Hartling/Mal Swann (Subaru WRX STI). In addition to being able to follow along with the teams in the service area and at the headquarters at the Walton Fire Department, fans in attendance at the only ECRC event held in the Maritimes were treated to a special “spectator zone” in Dartmouth on Saturday, thanks to Conrad Bros. Ltd. Four competitive stages were held in a confined private area before the competitors contested the remainder of the rally on Ledwidge Lumber Company gravel roads on Sunday.